MANILA, Philippines - A 15-year-old girl from Brooklyn, New York, who suffers from a hereditary disorder affecting the nerves and muscles, fulfilled her dream of meeting her favorite K-pop group SHINee. Donika Sterling is afflicted with Charcot-Marie-Tooth disease that affects the nerves. It is one of the most common inherited neurological disorders and in the US, 1 in 2,500 people is affected with the disease, according to the US National Institute of Neurological Disorders and Stroke. “The disease predominantly causes muscle weakness and decreased muscle bulk with typically limited decreased sensation. With Charcot-Marie-Tooth disease, symptoms may vary widely in severity, even among family members, but tend to slowly worsen over time,” according to the Mayo Clinic website. Donika and her family flew to Seoul last June 16 to meet her idols. Not only did she meet SHINee but had the chance to meet Super Junior members. Sterling’s trip was made through the generosity of Herbert Black, CEO of American Iron & Metal Co. in Montreal, Canada. Black heard Sterling’s story from her grandmother, who is a nurse in a hospital in New York, where he got medical care. Donika has been a fan of K-pop and she wished to meet her idols. On June 20, Donika visited the SM Entertainment office in Cheongdam, Seoul and met SHINee members. “I was very glad to hear that Donika came to Korea to meet us. I was deeply impressed when Donika said that she gets encouraged by our music and I hope she can cheer up,” said SHINee member Taemin. “I’m really excited now. It is nice to meet SHINee of my dream and very glad that I gained a great experience,” said Donika who gave Taemin, her favorite in SHINee, a letter. SM Entertainment said SHINee gave Donika gifts including a doll, albums, photo book and pictures. Taemin also gifted Donika with his own bracelet. SHINee performed “Ring Ding Dong” for Donika, which is her favorite SHINee song. 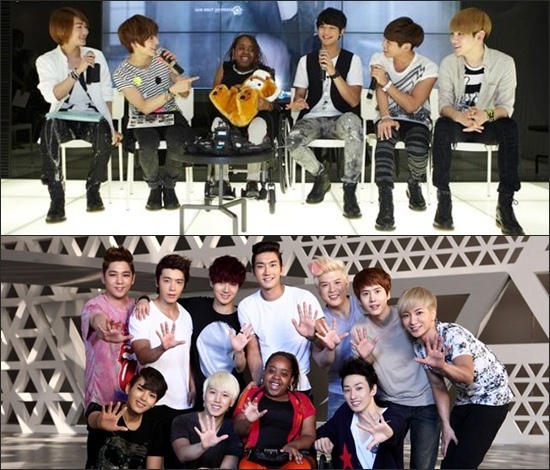 In addition, Donika also met Super Junior, who were shooting a music video for their upcoming album, in Namyangju, Gyeonggi. Donika received a gift and album from Super Junior, who also sang “Sorry Sorry."